Are you looking forward to going on a family vacation? But you have recently become happy parents and you can’t imagine spending one second away from your precious little one. Now you are challenged with wonder on how you will get your newborn to sleep well away from home. All those wonderful trips you’ve planned can become a reality with a travel bassinet which can tag along easily on your vacation. Here are the Top 3 best travel bassinets currently available on the market to make life easier for you and your little one. The Scuddles 3 in 1 portable foldable bassinet is known as one of highest quality travel bassinets that was designed by traveling parents. The bassinet converts into changing station and can be used as diaper bag all in one. A machine washable mattress pad makes life simpler. The foldable bassinet also has five large zip pockets for baby essentials and one insulated pocket for a temperature sensitive item. Manufacturer states this foldable bassinet can be used for a baby up to 2 years old. The Scuddles bassinet is a very fashionable bassinet made from materials of top-notch quality. It is well-built and is also completely waterproof so it can even withstand heavy rain. The multiple pockets of varying sizes comes in handy so you can store all your creams, wipes, towels and diapers in an easy and well-organized way. The 3 in 1 design creation gives you the option to use the bassinet and can also be used as a diaper bag while traveling. It also opens up to serve as a portable diaper changing station giving any parent the piece of mind having not to worry about dirty or yucky surfaces at airports or bus stations or anywhere. When your baby needs to go to sleep, it features a comfy mattress which provides a nice and cozy spot for the little one. 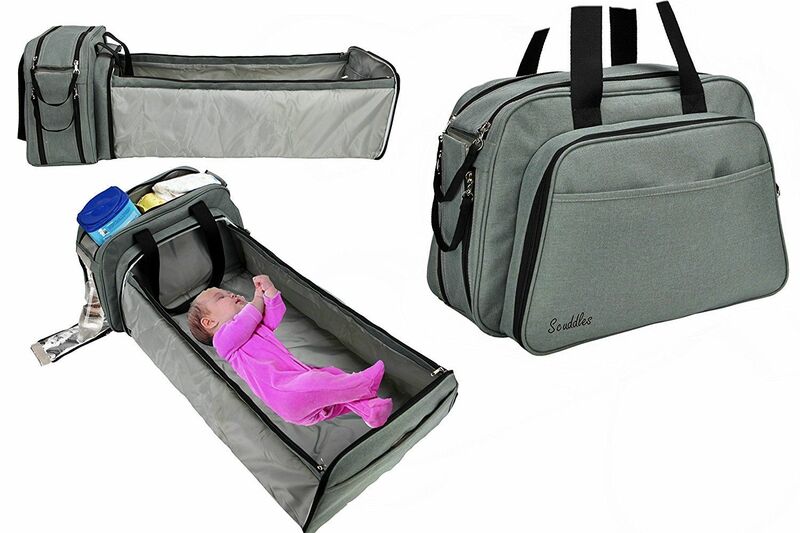 The Scuddles foldable bassinet is a great choice for travel. It also is budget friendly option. The Lamar Baby bassinet is another 3-in-1 foldable product option and one of the best travel bassinets out there. The manufacturer designed a waterproof bassinet using countless hours of designing, developing and testing to ensure that it meets the requirements of the most demanding parents and babies out there. The bassinet gives you versatility and multi-functionality while traveling. It has various elastic pockets to hold baby essentials. The bed size is 29" L x 14" W X 7" H.
Even though it doesn’t look as fashionable as the Scuddles bassinet, it is quite modern and features a wide variety of color-coded pockets for the storage and easy identification of creams, wipes, bottles, towels, and obviously, diapers. The materials used are heavy duty, from the very fabric of the bassinet to the straps and zippers. The manufacturer states that the zippers will last up to five years of constant use and abuse without jamming or deformation. The travel bassinet is fully water resistant so it can withstand rain or any kind of liquid spills. If it gets dirty, it’s easy to clean as you just need to wipe it with a damp towel. You can also wash it in your washing machine. The bassinet also features an insulated pocket which can keep food or bottles warm or cold for hours. Finally, the bassinet by Lamar Baby Care doubles as a diaper changing station, but this is of course the minimum requirement of any good travel bassinet. We think this travel bassinet is a great contender. The Warming Wings SmartNest travel bassinet is elegant, versatile and durable all in one. This travel bassinet becomes a multi-functional and portable baby travel cot, changing mat, play pen and storage unit. It has a 100% unique design and is super lightweight and easy to clean. 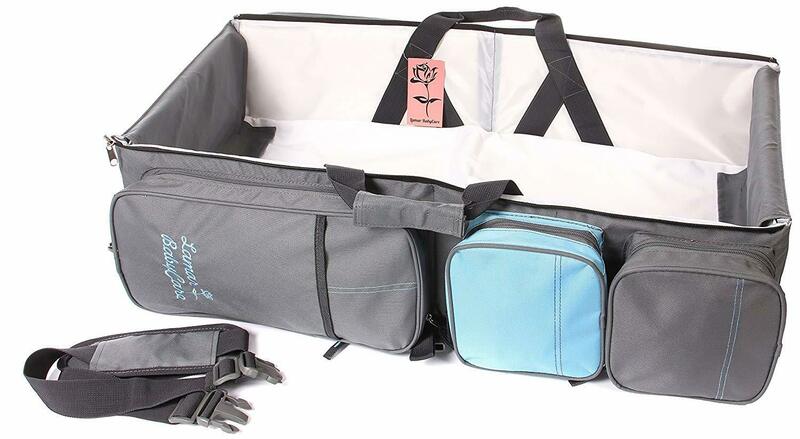 The travel bassinet also has a soft padded strap for easy carrying and thermal pocket for keeping the baby food warm. The Warming Wings SmartNest design is smart, classy and urban. The materials used are very durable and the fabric is quite easy to clean. Like its rivals, it is loaded with pockets and compartments. The game changer is that it can serve multiple useful functions for your baby. Your baby can sleep very comfortably in a roomy bassinet and also use it for changing diapers. One unique feature this travel bassinet has that stands out from the rest is the ability to serve as a neat little playpen that is completely safe for your little one. Some say you should save the best for last. In this case we’ve decided to do just that. It is quite superior to most other travel bassinets on the market even though it is also considerably more expensive. This is definitely our favorite travel bassinet of the bunch. On the market today is an abundant of variety of travel bassinets. We would choose the SmartNest from Warming Wings best for durability and essential for your baby’s needs. We strongly believe that the best travel bassinets need to serve multiple purposes and when it comes it that this one is really hard to beat. It is a comfortable bassinet that you can use to change diapers and your baby can also use it as a playpen. On top of that it is well made and easy to use, and looks good to boot. A no-brainer! Happy traveling with your little one!